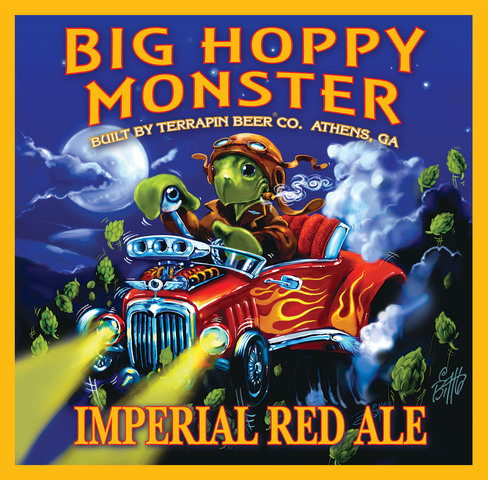 For the last tasting note in my week-long “Terrapin Six-Pack”, I’m tackling one of my favorites…the Big Hoppy Monster. Imperial IPAs are the “brew du jour” in the US today. It seems that Americans simply can’t get enough hops. Much like money, fame, and cheese fries, our cultural instinct is to always want more, more, more…and that apparently goes for hop bitterness too. American breweries have developed Double IPAs, Triple IPAs…hell, there are even a few Quadruple IPAs out there (though personally, I think that’s over the line, Smokey). Some beers are pushing 150 and 200 IBUs these days…and that’s great if you’re into beers that are so bitter your face implodes like a black hole. Personally, I like a little balance to my brew. I prefer a beer with a strong malt backbone and the sad truth is, many of the extreme-hopped Imperial IPAs out there (many, but not all) have sacrificed that malt profile at the altar of hops. Fortunately, there are brewers like Terrapin who let you have your cake and eat it too…thanks to beers like the Big Hoppy Monster. The Big Hoppy Monster is an “imperial red ale” which means it has the malty-sweet profile of a traditional American red/amber but the hops have been goosed up to Imperial IPA levels. If that sounds tricky…well, it probably is. But the master brewers in Athens have figured it out and then some…this is just a solid beverage through and through. The Monster pours with a deep, lush, chestnut red color and a light taupe head that is knit as tight as silk. The retention is very impressive, as is the sparkling lacing that sticks to the sides of the glass beautifully. This is an elegant brew. *I do the best I can with these notes, but Wifey McHops is far better at aroma differentiation and identification than me and she didn’t participate in this tasting. The taste is impressive. The malt, hops, and fruit esters have all been ramped up to 11, but none of them drown out the others. The chocolate and caramel of the malt is sticky-sweet, but they’re cut through perfectly by the bold citric flavors of the hops. The fruit and a touch of pine are present throughout and the finish reveals a nice mix of hop bitterness and warming alcohol. The Big Hoppy Monster has an excellent mouthfeel…medium-bodied, but lush, full, and smooth with gentle but pervasive carbonation. Drinkability on the Monster is high in my book, but that’s just because it’s a great beer. The truth is, at 8.75% ABV and with such a complex and well-balanced nose and flavor, this is a beer that needs to be sipped to be appreciated. Of course, I usually don’t stop sipping until they’re all gone. 4 Hops from Brother Barley. Posted in Tasting Notes.Tagged Big Hoppy Monster, Imperial, Red Ale, Terrapin.